•‘The historian with a taste for the flavours of time past.’ Yorkshire Post •‘A wonderful new book brings back gravy-scented memories, and in doing so examines the history and mystery of the only English county that thinks it's a country.’ Daily Mail Sept 15th, 2014 • ‘Traditional Food in Yorkshire is not driven by nostalgia, but rather by deep affection.’ Times Literary Supplement August 6th 2014 • BBC Radio 4 Food programme half hour feature September 8th 2014There has been no serious consideration of local food in England. Most available material is lightweight, not very informative, and a waste of time for serious students. Prospect Books is about to change this, in the first instance with respect to the north country. 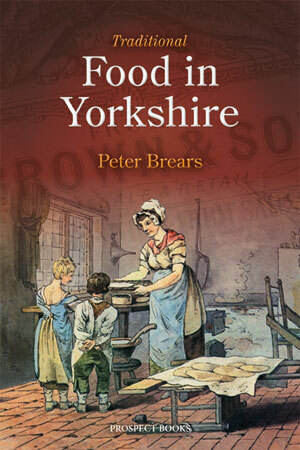 Last year Peter Brears published Traditional Food in Northumbria (Excellent Press). This title has now been taken on by Prospect Books. The next county for treatment is Yorkshire, the author’s home. He has already written on this subject (John Donald, 1987) but this new work is double the length, with many more illustrations and supporting material.The book opens with a survey of the various economic and social groups in the county. progresses to a study of cooking, fuel and installations, then concentrates in a series of single subject chapters on staple foods – porridge, oatcake, bread, meat, fish, puddings, and cakes. There then follows chapters on dairy products and drinks, and closes with a folkloric survey of feats, fairs and calendar customers, and rites of passage such as headwashings, weddings and funerals.This is a book that every Yorkshireman needs. It will be as essential to the present-day resident, as to the vast number of the Yorkshire diaspora. And it will be very welcome to those who have felt the acute lack of any proper study of English food over the last few decades.Peter Brears is former Director of the Leeds City Museums and one of England’s foremost authorities on domestic artifacts and historical kitchens and cooking technology. This year he is also publishing Cooking and Dining in Tudor & Early Stuart England with Prospect Books. This book is a Yorkshireman’s labour of love. Peter Brears is a former curator of the Castle Museum in York and a former director of Leeds city museums. He has now written and illustrated an extraordinary book which he hopes will be seen as a “virtual folk-museum” of Yorkshire. What people have eaten in the recent past is, to him, a key to the way they lived, worked and died. His timespan is 1800 to 1920, a period that, he argues, brought “unprecedented changes” to a county which “had hardly changed since the Middle Ages”. Much of Yorkshire, especially the West Riding, was transformed into a hive of industry, with a cuisine to match. Let us be clear what Brears means by “Yorkshire”. Like Nikolaus Pevsner in his Buildings of England series, Brears thinks that long-standing county boundaries have a cultural importance unaffected by the Heath government’s changes of the early 1970s. The map at the front of his book is unabashed. To the north, the lovely town of Sedbergh is still in the West Riding (not Cumbria). So is Sheffield (there is no autonomous South Yorkshire). Traditonal Food in Yorkshire is not, however, driven by nostalgia, but rather by deep affection. The tone is antiquarian. The old styles of cast-iron kitchen ranges, where most of the cooking was done, are portrayed and discussed with all the passion of a trainspotter. So are the uses of a creel (as a frame for hanging oat-cakes, not an implement for penning fish in). Contents run from jobs (farmworkers; miners) through characteristic dishes (puddings; cakes) to food for special days (washday pie; funeral biscuits). Brears argues, persuasively, that food was, and is, central to understanding “Yorkshireness”. This passion goes far beyond the well-known favourites of strong tea, parkin (a kind of gingerbread), fish and chips, dark toffee, and cheese eaten with cake. We learn here how kippers were invented; why miners liked sparrow pie; how chapels used cakes and buns in their internecine battles to boost congregations. Some sample pages are available.